Magic Heart with owner Keith Bailey at Blowing Rock in 1967 or ’68. Most of the bay Thoroughbred mare’s major show winnings came when she was named Balalaika, but for one, she will always be her Magic Heart. Foaled in Kentucky on Tax Day in 1962, the big filly by the hard-knocking Nan’s Mink (89 career races), out of the unraced Evening Magic (by Bull Brier), was born with a perfectly shaped heart on her forehead. When it came time to register his filly, Kentucky breeder Lewis Haggin had the perfect name for her – Magic Heart. Mr. Haggin raced Magic Heart 15 times as a two and three-year-old. She never won a race. When it didn’t look like she was going to make a race horse, Mr. Haggin sold Magic Heart in a Horses-In-Training sale in Kentucky. It was there that the hands of fate turned for the three-year-old filly when an East Tennessee riding instructor named Betty Kendall bought her. 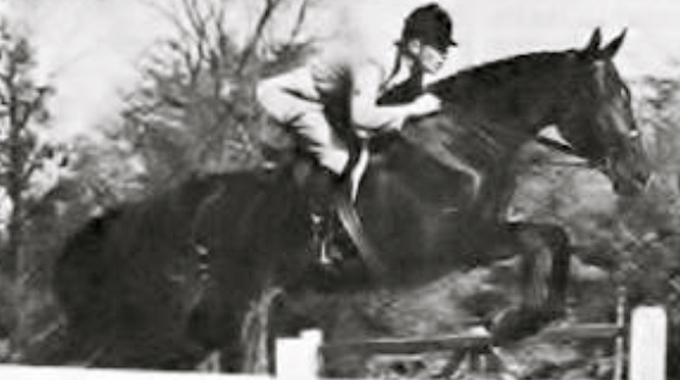 Mrs. Kendall had a teenage niece named Keith Bailey that rode and showed with her. As soon as Keith saw Magic Heart, she fell in love with the three-year-old. Unbeknownst to her father, Keith traded her expensive well-made Junior Hunter to her aunt for the racetrack-trained Magic Heart. It was a match made in Heaven and a love that endured for over twenty years. When Keith and her Magic Heart were ready to do the A show circuit, she moved to train with top trainer Sue Ashe. They showed throughout Tennessee, Kentucky, and other states in Zones 4 and 5 for three years, winning wherever they went. Sue said that at the show at the Red Mile in Lexington, Kentucky, there was a square pen that was meant to be jumped in two strides. Magic Heart jumped it in one stride and won the class. Everyone, including Kenny Wheeler, wanted to buy the phenomenal mare, but Keith wouldn’t sell her. When Keith aged out of the Junior division, her father stopped supporting her horse habit and Magic Heart was turned out in a field with the cattle at Keith’s grandmother’s farm. Eighteen months later, Keith decided she wanted a car and sold her beloved Magic Heart to her father in exchange for a Jaguar XKE (which was stolen six months later as Keith checked into a hotel). Balaika with Joey Darby riding, owned by Mrs. Alvin Wasserman, at Devon in 1971. Sue Ashe was enlisted to sell Magic Heart for Mr. Bailey. She called Joey Darby and took him to the cow field to see Magic Heart. Joey got his customer, Mrs. Alvin Wasserman, to buy the great mare for her son Gary to show in the Amateur Owner Hunter division and for Joey to show in the Working Hunters. Gary Wasserman named his new mare, Balalaika, after the triangular Russian stringed-instrument that sounds similar to a mandolin. For the next three years (’71, ’72. And ’73), Balalaika was a major star in the Working Hunter division with Joey Darby aboard, and won more than her fair share in the Amateurs with Gary Wasserman riding. One of her major wins in 1971, after the Wassermans bought her, Balalaika was Champion Working Hunter at Washington International. Balalaika with Dennis Murphy riding, owned by the United States Equestrian Team, at La Baule in 1974. At the end of 1973, the Wassermans donated Balalaika to the United States Equestrian Team. Dennis Murphy showed her for the U.S. 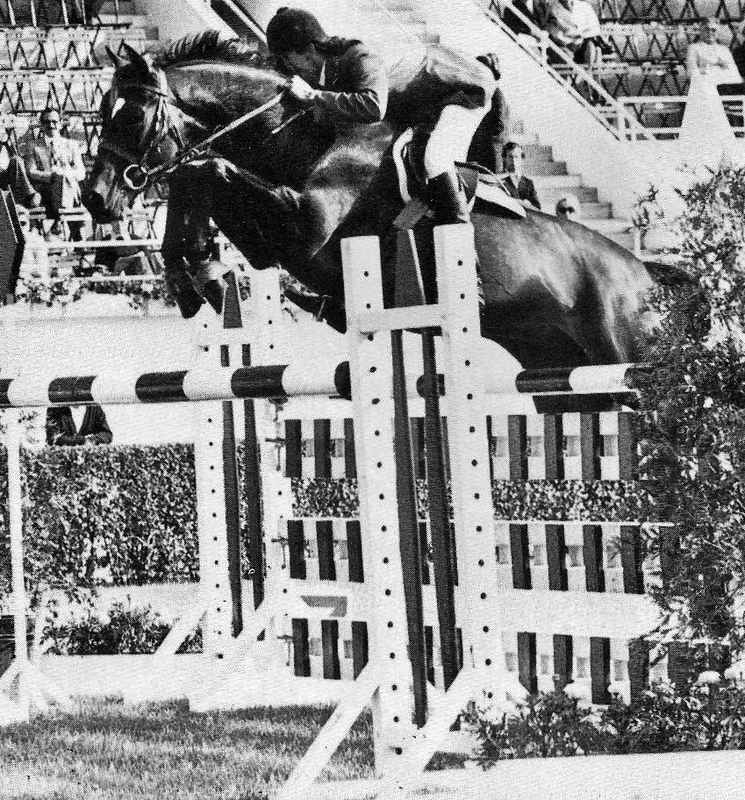 Team in the International Jumpers in Europe in 1974. 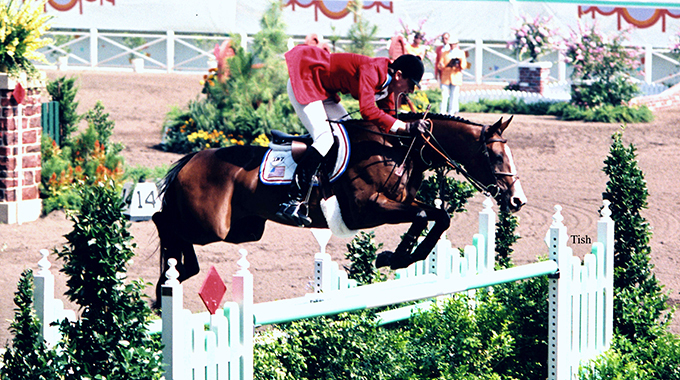 Buddy Brown showed Balalaika some in 1975, including at the National Horse Show where they were part of the International Team Champion USET. Pennsylvania’s Winterwood, a stallion station and nursery, was Balalaika’s new home after the indoor shows. 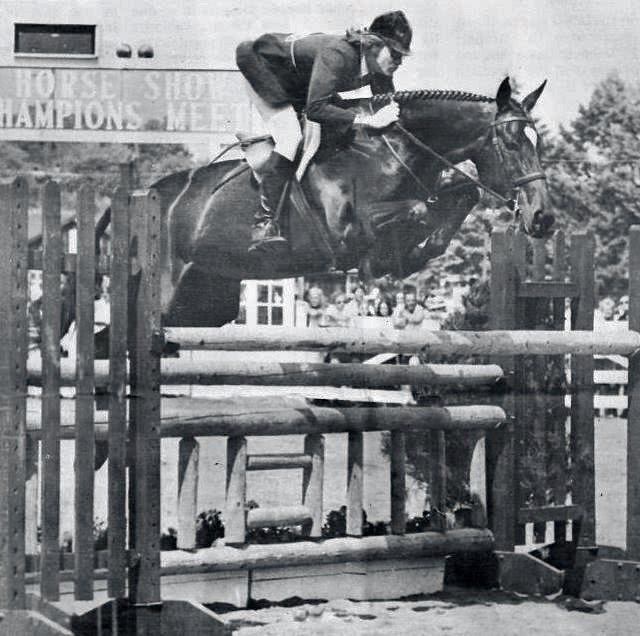 In early 1976, she was bred to the nice Thoroughbred stallion, Catch On Fire (by Bonne Nuit’s son Night Lark, out of Eastmas who was also the dam of National Show Hunter Hall Of Fame inductee Navy Commander). 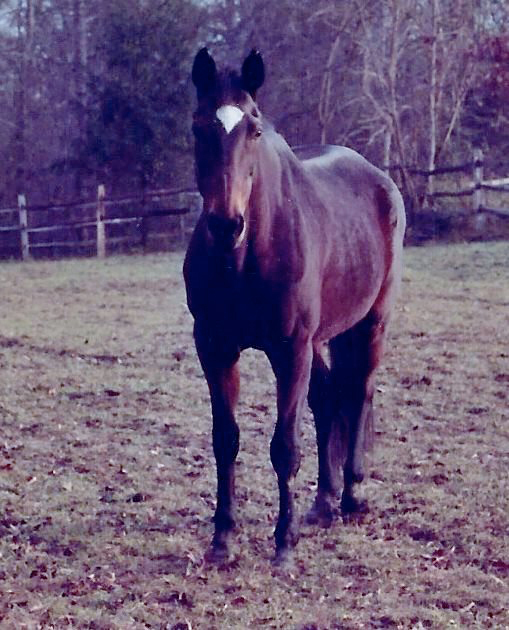 When Winterwood dispersed their horses in 1978, Balalaika was sold with a foal at her side by Catch On Fire and back in foal to him to a farm in New Jersey. 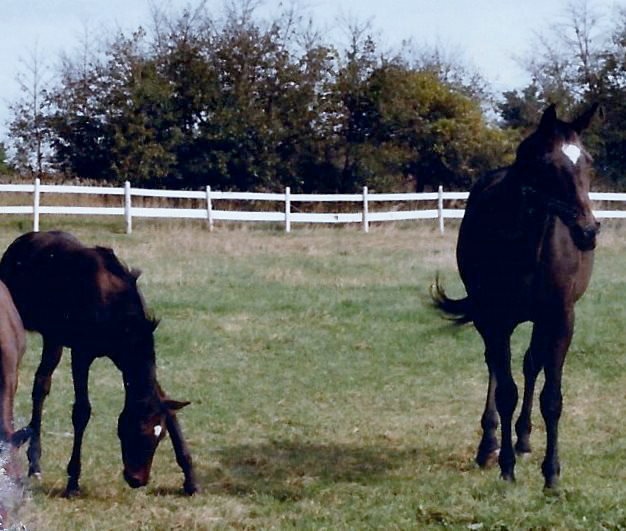 Magic Heart with her foal by Keelo at her side in Knoxville. By July of 1982, the great mare, who had been passed around so much later in her life, had found her way back to Keith Bailey. It took $20,000 for Keith to buy her favorite 20-year-old horse and get her back home to Knoxville. Once again, she became known as Magic Heart. She had been bred to Keelo (owned by L.P. Tate that stood at Ennis Jenkins’ Hilltop Stable) in 1981 and arrived at Keith’s with a bay filly by her side that was a spittin’ image of herself – including the heart in her forehead. Paying homage to the name that the great show horse was best known, Keith registered the foal with The Jockey Club as Balalaika. Magic Heart’s 3-year-old filly named Balalaika showing in-hand. Magic Heart lived out her days at Jimmy Wofford’s farm in South Carolina. She passed at the age of 26 from natural causes. Balalaika was nominated for the National Show Hunter Hall Of Fame in 2016. Magic Heart at age 20 in Knoxville. 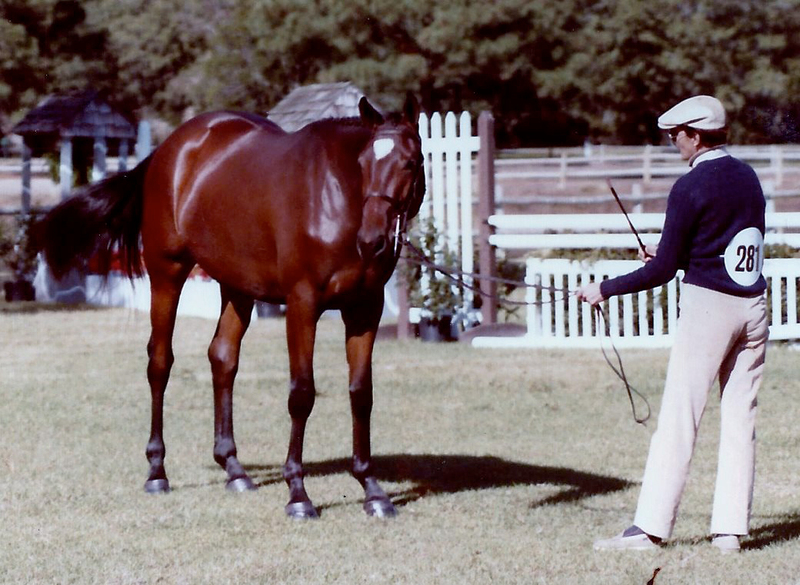 Showing at the A shows during the 60s, 70s, 80s, and early 90s, Marianne was blessed to see some of the greatest Thoroughbred Show Hunters, Jumpers, and horsemen of all time. 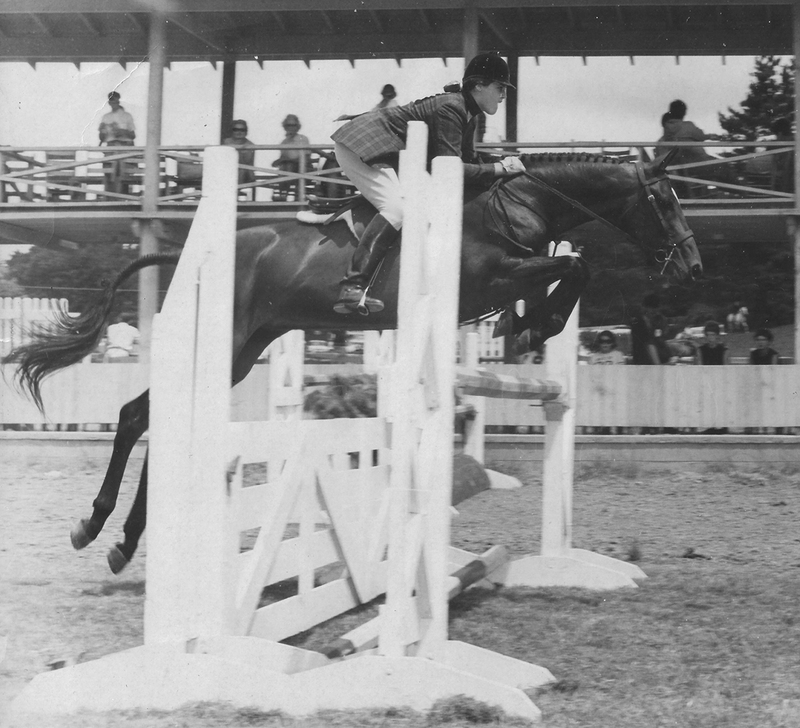 Through this blog, she will write about some of the top Thoroughbreds in the history of showing. A lifelong love of horses guided her to form the Facebook group “Hunters & Jumpers: The First 100 Years” in January of 2015 where she posts pictures and stories about some of the horses, ponies, and people that make up the history of Hunters and Jumpers from the beginning through 1999. Marianne Taylor shares the story of one of the most legendary Thoroughbreds of all time, Touch Of Class. 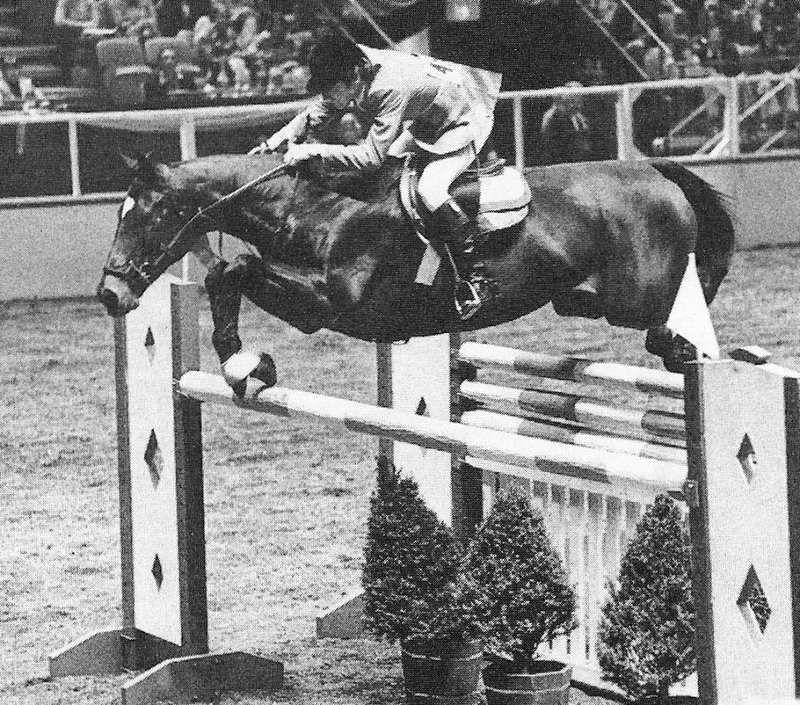 The partnership between this wonderful mare and Joe Fargis brought them a double gold at the 1984 Olympics. Bernie talks about the Thoroughbred Idle Dice, a horse he had a very special relationship with. 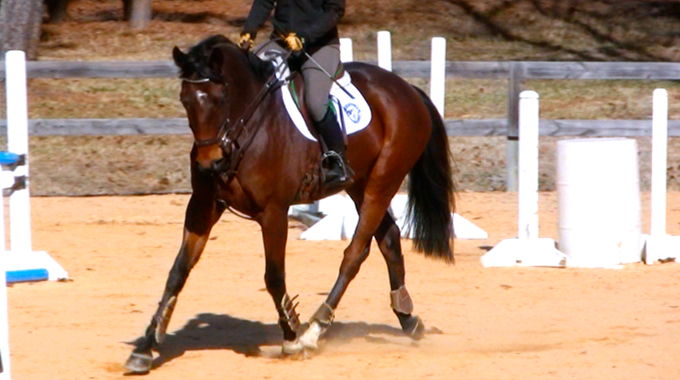 Jim Wofford explains how to train a young OTTB on the flat for three-day eventing so they are ready for the dressage phase. Thank you, Gary. That means a lot to me. I hope you and Linda are coming to the reunion at Devon on Wednesday, June 1st from 4 PM – 6 PM in the Groom’s Kitchen tent. “My Heart” A once in a lifetime horse! Keith, I hope I did your great mare justice. She was phenomenal. Jimmy Wofford was my life long mentor, I lived on his farm, grew up riding for him and he introduced me to everyone as his daughter. This article brought back so many memories of Balalika and my wonderful childhood spent on Dutch Creek Farm. Every foal she had looked exactly like her! Carbon copies! Thank you for writing such a lovely piece on a mare whose legacy lives on in every generation. I know that Jimmy is in heaven watching her do her “Jane Fonda Workout” at the gate. I miss them both so. Thank you so very much, Cissie. It was great to hear from you.